If you walk into Egner Hall and ask any West Point Band musician what the band’s mission is, the response would most certainly be, “to provide world-class music to educate, train, and inspire the Corps of Cadets…” While this is certainly our primary focus at the United States Military Academy, it is one of many, many missions that we pursue in the band. Amidst a constantly evolving and often chaotic operations schedule — USMA reviews, and Trophy Point concert series, and patriotic parades — smaller contingents of the band are running in every direction to complete additional missions. 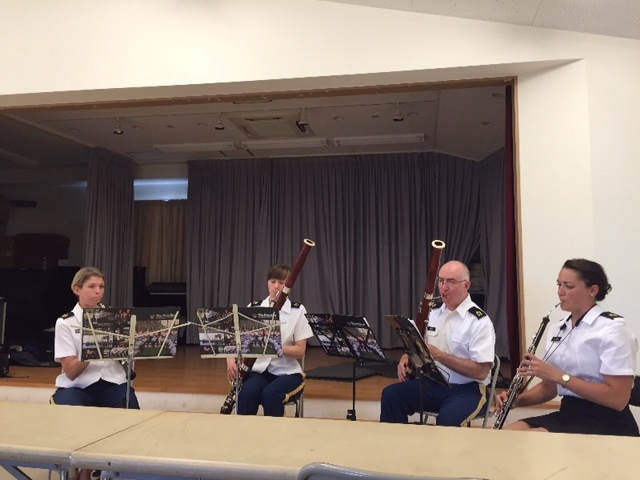 You can find West Point Band musicians playing on news networks in New York City, at sporting events, patriotic ceremonies, hops (formal dances), banquets, and community concert series. In addition to all of these, the West Point Band also pursues an education outreach program that serves the local Hudson Valley and New York communities. As professional musicians, we are personally invested in the quality of arts education in our country. The arts help students explore ideas and relationships that cannot be conveyed easily in a traditional classroom. Studies have consistently shown that arts education can engender innovative problem solving, develop critical thinking and cognitive skills, and promote self-discipline, self-esteem, and teamwork. We are delighted whenever there is an opportunity to bring music back into schools, particularly in a time when funding for arts education is being slashed around the country. According to the Department of Education’s report Arts Education in Public Elementary and Secondary Schools: 2009-2010, more than 1.3 million students in elementary school receive no music instruction. The same is true for roughly 800,000 secondary school students. Schools in higher income areas consistently offer more music and arts classes than schools in poor areas, a finding consistent with both reports. While 93% of Americans agree that the arts are vital to providing a well-rounded education for children, the arts remain on the fringe of education. Staff Sgt. Katrina Elsnick teaches young children about the flute at the “instrument petting zoo” portion of the Quintette 7 Kids’ Night Concert. The West Point Band’s education outreach division helps to fill that gap by bringing band musicians to elementary and junior high schools, opening the doors of discovery for young people who might otherwise not have the opportunity to hear live classical music. The summer was a very busy season for the outreach team. On July 6th, members of the band and the education outreach division performed chamber music for and coached the New Jersey Youth Symphony. 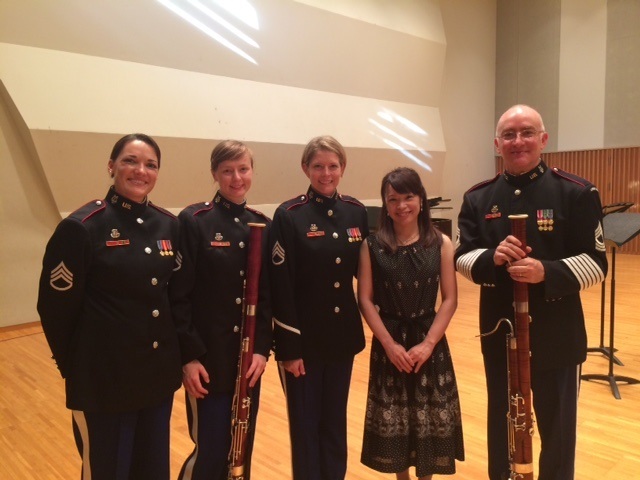 The following week, the West Point Woodwind Quintet performed in the Summer Music Institute at Monroe-Woodbury Middle School. The quintet performed an innovative “menu-style” program for choir, orchestra, and band students. Audience members were given a raffle ticket, and those whose numbers were drawn chose the music to be performed from a list of prepared repertoire. This creative approach to engaging young audiences resulted in extremely positive feedback from the students, parents, and teachers. In August, Quintette 7 performed its popular children’s concert as part of the Trophy Point summer concert series. Based on storytelling, Quintette 7 set music to popular children’s books, like The Very Hungry Caterpillar. Other stories were written by members of the West Point Band and included a tale about a West Point cadet and an exciting journey through New York City. Aided with props, members of the West Point Band interacted with its young audience through dancing, clapping, and marching. Staff Sgt. Barry Cooper entertains kids for Quintette 7’s annual Kids’ Night concert at Trophy Point. Additionally, our outreach team organizes field trips in which students from local schools can watch and participate in West Point Band rehearsals at our home, Egner Hall. Most recently, on September 22nd the education outreach division presented the West Point Band’s annual Young People’s Concert. Nearly 1,000 elementary and middle school students attended this concert, which had been tailored specifically to them. The concert program, “Music Moves You,” explored the way that music moves us physically and mentally in our everyday lives. 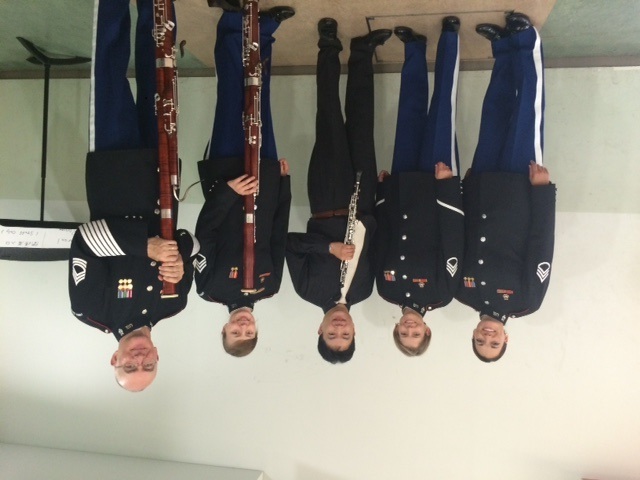 It featured the West Point Concert Band, Quintette 7, and vocalist Staff Sgt. Emily Mcaleesejergins. Consistent with all of the outreach performances, the concert was a hit, and the kids left the hall with grins on their faces. Master Sgt. Michael Reifenberg and Staff Sgt. Kristen Mather de Andrade perform at “Kids’ Night with Quintette 7” at Trophy Point. Staff Sgt. Kristen Mather de Andrade is head of the education outreach division, and she continues to help the band present successful programs to young audiences in the community. 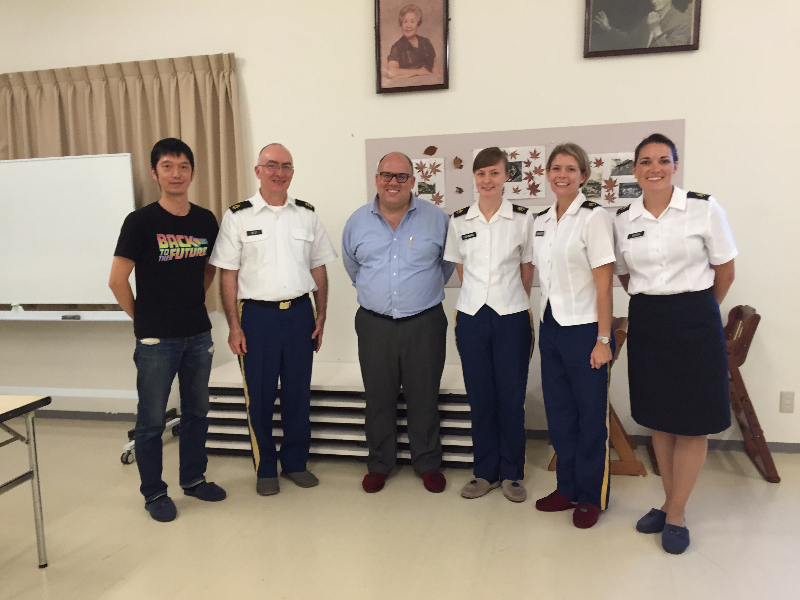 “As ambassadors of the United States Military Academy, outreach is one the biggest parts of our job. We have the opportunity to not only share the inspiring stories of the cadets and the academy to the communities we serve, but also to do so with some really great music. As a musician in the military, nothing is more gratifying than reaching someone, regardless of their age, with a great performance and a healthy dose of positivity,” she said. With a healthy dose of positivity and a strong sense of humor, the West Point Band’s education outreach division continues to reach young audiences with innovative and entertaining concerts. Not only are they serving an important (and sometimes forgotten) demographic of the Hudson Valley community, but they are also promoting arts education for the next generation. Check the West Point Band calendar for an outreach concert near you! All your Trophy Point questions answered!